Its hard to believe that Barcode Basics is three years old this month – where did all that time go? The anniversary coincides nicely with the release of version 4.0 of our flagship macOS barcode generator. The main thing you’ll notice is the addition of a barcode preview window. However, Barcode Basics version 4.0 is also a complete, ground up rewrite. If you don’t notice too much of a difference then that’s a good thing – it means we got it right! So, why rewrite? Well, we wanted to restructure the app in a way that would make it easier to add some cool new functionality we have planned for coming releases. If you’re interested in producing batches of barcodes then we’ll have some pleasant surprises for you. As always, this upgrade is free for existing users of Barcode Basics. Barcode Basics, our barcode creator for Mac OS X, has been reduced to $8.99 USD / £6.99 GBP with immediate effect. Get it while it’s hot! Barcode Basics supports a wide range of barcode types along with features required by professional designers including BWR and vector output (eps). Click the app store logo below for more info. Choosing the right font just got easier! 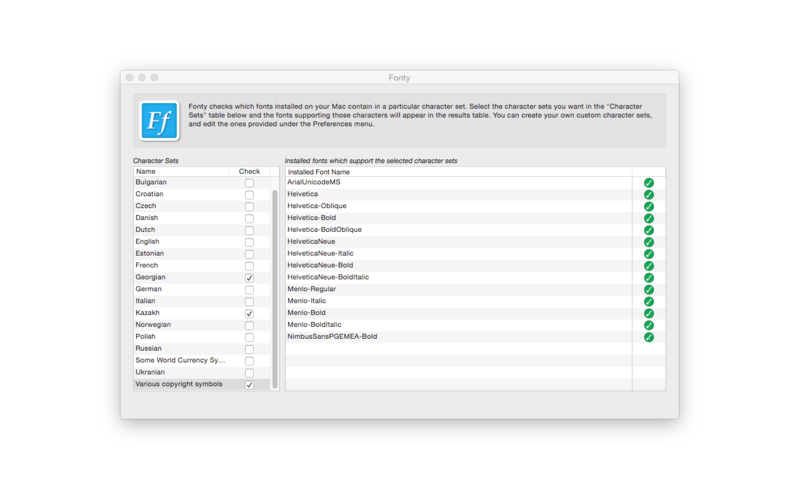 We’re pleased to announce that our new app, Fonty is now available on the Mac App Store. 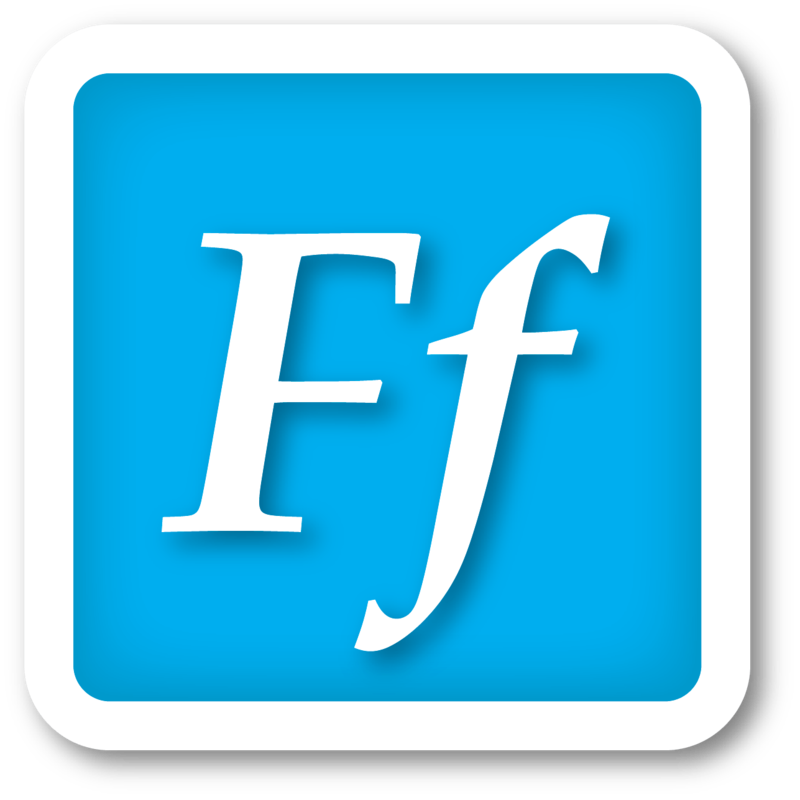 Fonty is an invaluable tool for anyone working with multiple languages. Whether you’re a digital typesetter, graphic designer or translator, Fonty can help you choose the right font for the job. 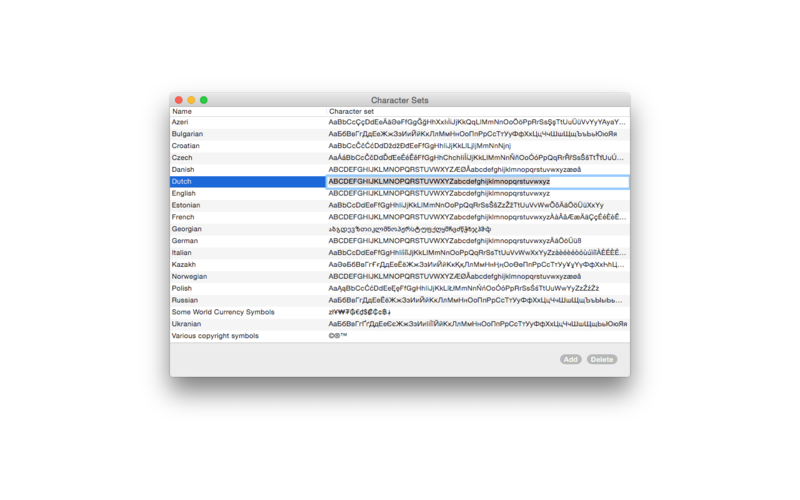 Fonty scans the fonts installed in your Mac and checks shows which ones contain one or more character set of your choosing. For example, maybe you need to choose a font that contains the Euro currency symbol and also supports Cyrillic (Russian) characters. Or a font that supports the Greek and Kazakh alphabet. Fonty can help you do this! Of course, you can use the built-in character sets. However, the real power of Fonty comes from the ability to create or edit character sets of your own as you see fit. Look under the Preferences menu to work with character sets.